If you have decided on your ultimate touring camper, the next item on your list is the tow vehicle with which you propose to haul it. It’s surprising how many people make their camper and tow tug decisions quite independent of each other when the relationship between the two is so critical to your safety and enjoyment, and impacts where you can travel. We were fortunate in being able to choose the perfect match and, after selecting the New Age Oz Classic 20 Series as an ideal caravan in which to spend quality time touring, we set about looking at the ideal vehicle to hang it on. And the tow vehicle chosen to carry out this task is a current model Toyota LandCruiser 200 Series. It’s not a totally off-the-shelf job, but the way it’s been specced and equipped makes it a blueprint for what we consider to be the ultimate tow tug. 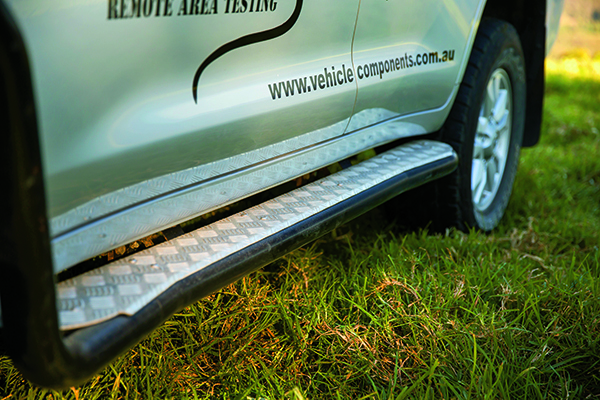 As the vehicle is required to test VC’s independent suspension systems, such as its Cruisemaster XT, which can have a load rating of up to 4500kg, it was sent to ARB to have a GVM (Gross Vehicle Mass) upgrade to 3850kg, which incorporates a 50mm lift. This had to be completed and certified by ARB before the vehicle could be registered. 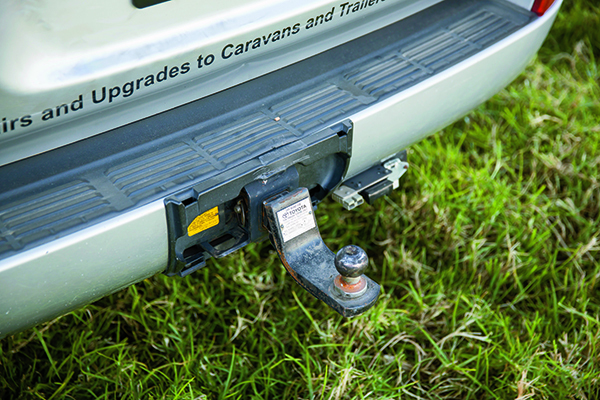 This upgrade doesn’t increase the LC200’s GCM (Gross Combination Mass), which means that load carrying capacity does not increase when towing at the maximum load of 3500kg and ball load is still limited by the towbar’s capacity; however, when under this limit, the tow vehicle is rated to carry more equipment. 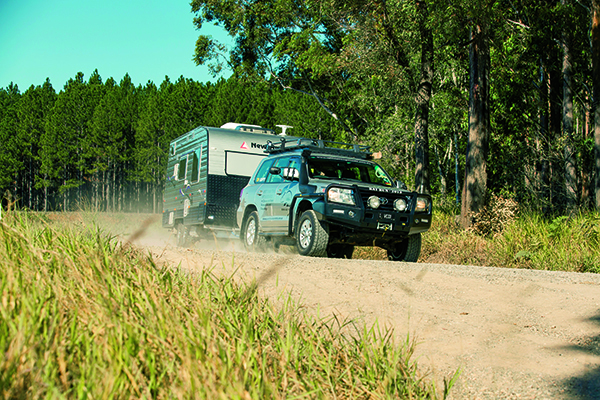 It’s something well worth considering if you’re planning to tow a camper or caravan with an ATM of 3000kg or more, as it gives you an added safety margin, particularly in outback areas where carrying additional fuel and water is a very good idea. The rear suspension is supplemented with heavy duty Coil-Rite air helper springs supplied by Airbag Man. This enables the rear suspension to be adjustable for varying load and road conditions by simply inflating or deflating them. 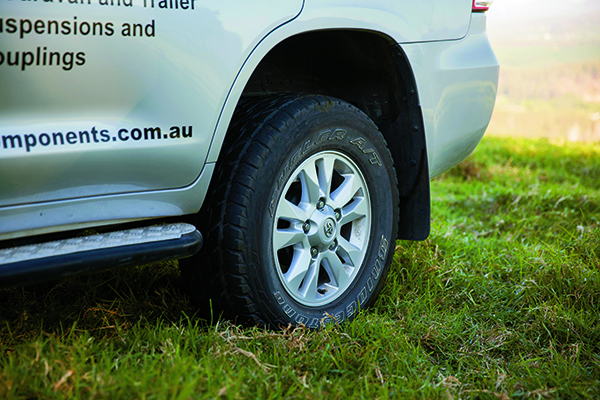 VC’s LC200 is, naturally, fitted with one of the company’s Hitchmaster DO35 multi-directional offroad hitches. A heavier-duty DO45 hitch for larger offroad trailers is also available. The LC200 is fitted with a Tekonsha P3 brake controller, mounted conveniently beside the steering column. The LC200 comes as standard with twin batteries under the bonnet, but VC added a third (an Optima deep-cycle) with a Redarc battery management system and a 350W inverter to ensure it could run all their data measuring equipment without power interruption. Anyone considering extended remote area towing would be advised to do the same. 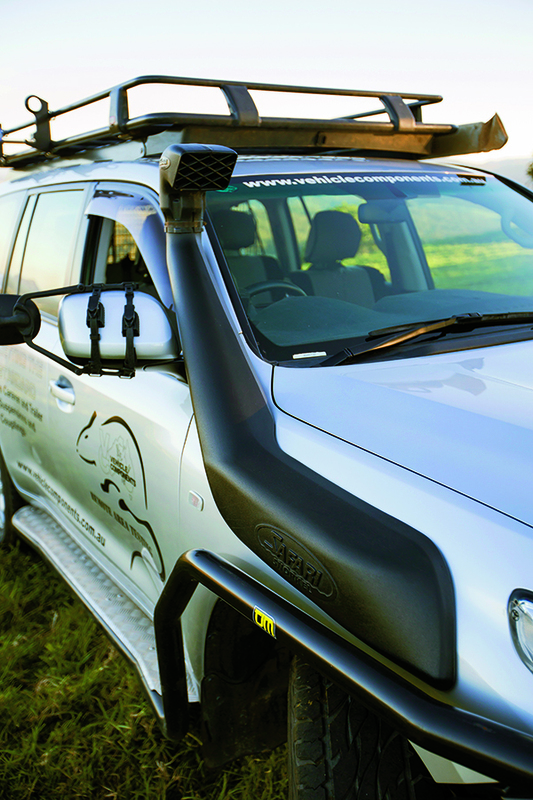 ARB also fitted the Toyota’s Safari snorkel to allow it to travel for prolonged periods in dirty conditions or to cope with deep creek crossings without fear of engine damage. 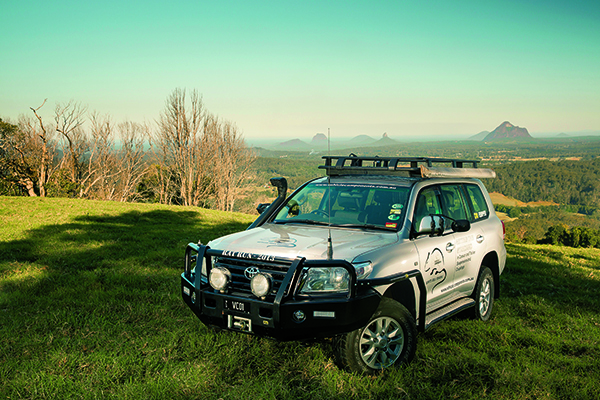 While at ARB, the LandCruiser was fitted with an aluminium series ARB roof rack for carrying camping gear and spare tyre carcasses. This is fitted with a shovel and high-lift jack mounting points. A TJM steel bull bar with brush bars and side steps has been fitted, along with a TJM 9000lb winch. Touring remote areas always presents the possibility of an animal strike, which can prove very costly and very dangerous. 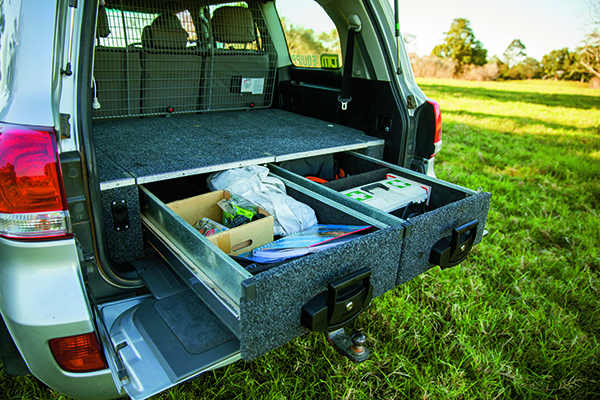 An Outback Roller Draw System and an Outback Cargo Barrier have been fitted to ensure everything is quickly accessible and stays safely in its place, away from the vehicle occupants. Chris Goddard’s personal tyre preference is for Bridgestone’s 697 offroad tyres, which he says are great all-rounders, “quiet, good-wearing, good in the rough and pretty good in sand”. An Airbag Man compressor is mounted under the driver’s seat to speed re-inflation if the pressures need to be dropped for comfort or traction on corrugations or sandy sections. 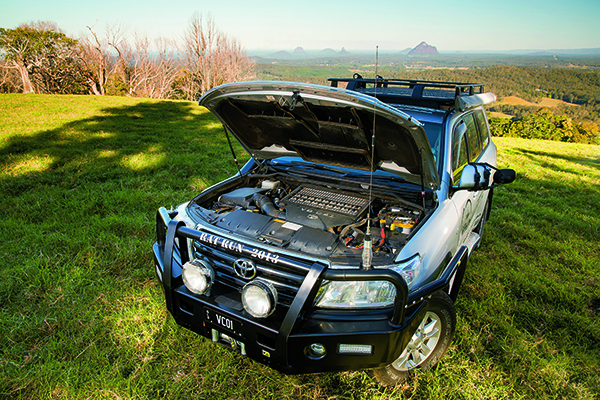 The Toyota is equipped with bull bar-mounted IPF Extreme spotlights, which have copped a battering during many trips and are now due for replacement. 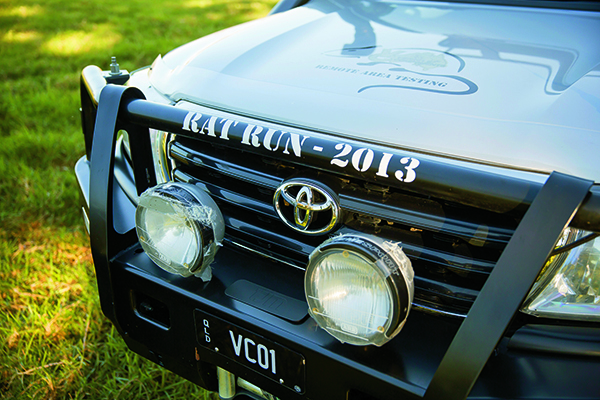 The standard LandCruiser headlamps are protected from stone damage by Toyota plastic covers. A GME CB radio is fitted with “town and country” masts on the bulbar – a “wire” mast is used around town, while it is replaced by a taller fibreglass antenna once the city limits are cleared. To keep the seats dust-free, cool and comfortable, Chris has fitted his Cruiser with breathable MSA canvas seat covers and MSA seat-back storage organiser bags, which he says are ideal for storing maps and all the other things you need to get your hands on conveniently when travelling long distances. 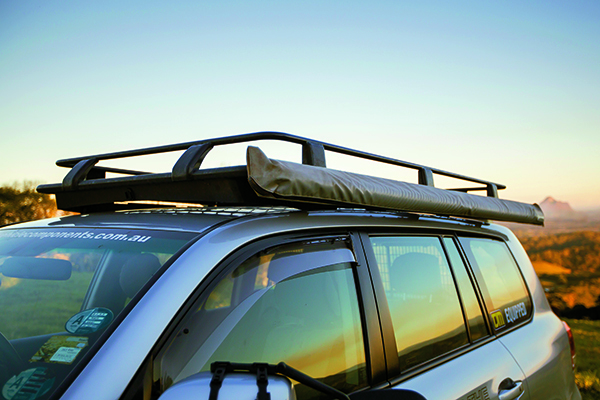 A Gunyah side awning is attached to the passenger side of the roof rack to provide shade during travelling stops in hot weather when there isn’t a tree in sight.